“the law” of violent enforcer of dead-ends as basically unsound? Who or what wants this fool’s course? Protect us not just some certain weapons-corps peculiarly. Such like Alliant Tech (DU) and Lockheed (in UK) pull disappearing activity to keep from losing their suicidal short-term surety. So with song, dance and young band together now all realists, humanists, environmentalists, activists and unionists! as expected, David Corcoran entered a plea agreement in federal court in illinois on wednesday, december 28. the agreement is a simple plea of guilty for his july 5, 2010 action at the Y12 nuclear weapons complex in oak ridge, tn. dave’s record places him in the 0-6 months sentencing range. no word on the sentencing date. as most of you know, dave’s health prevented him from joining his colleagues and co-defendants at trial and sentencing in tennessee. we are pleased he has been able to have his case moved, but we sure miss him and barb! please continue to hold dave and barb in the light as they move forward through this process. It’s Christmas Eve. As we prepare for the coming of the Prince of Peace many of our comrades are spending Christmas in prison for following in His nonviolent ways. Meanwhile, the Grinch has scheduled yet another trial for Y-12 resister David Corcoran who was unable to be tried with the rest of the group earlier this year. Here is an update from Ralph Hutchison of OREPA. We have received word from the Corcorans that Dave’s trial is scheduled for wednesday, December 28. He is represented by a family friend and intends to enter a plea of guilty. Dave expects to be sentenced in january. I am not sure what his point range is, but he indicated he expects he might receive as much as 6 months. We’ll send more information when we know it. May you all find Peace in this season of miracles, and may we all find strength to continue the long struggle for a nuclear weapon-free world in the coming year. There’s a lot of kindness here in prison, but there will be a relief when the holiday season is over, at least for me. Many of the women are having a hard time; Christmas seems to be a major time marker in our lives. “I won’t be here next Christmas” a few women say, and the silence of the others says, “I’ll be here for 11 more Christmases”, or for the lifers… a real silence, and I’m not sure what they think. There is always a hope of getting out as a result of something that might develop. For example, we hear there’s a bill in congress that would release anyone in federal prison who has done half their time if they were here for a nonviolent crime, and are over a certain age, maybe 65. Many women are getting immediate release for the cocaine/crack equalization resentencing law that passed. But, all that to say, Christmas is a hard time to be here for most of the women, and of course it’s a time of missing family gatherings, or what the culture tells us we should be feeling. Yesterday Alan, from the Buddhist Peace Fellowship, came for the regular thursday meditation. I like when he comes, we sit for a good half hour, and then walk in silence. It is a very sweet time; I find myself looking forward to it. He asked us each to talk about how we were feeling, about the holiday season and so on. After the silence, after the trust that’s built up, it was a good sharing. I shared that in my tradition Advent is a time of preparing our hearts for the compassion and nonviolence of Jesus, and that the Advent readings ingup to the coming of the Prince of Peace help us with that preparation, helping us open our hearts so that we can receive that deep peace. There is, however, an understandable tendency to not live life here, but to live life looking forward to what will happen when released. I try to do my time realizing that this is part of my life; no matter where I am, our purpose is to love others, be compassionate, do what we were created to do. Of course I fail all the time, but that’s no surprise. In this time of Advent, and with the Winter Solstice just a day away, I find myself looking for light in everyday encounters and finding the center wherever it presents itself. I learned from Ciaron O’Reilly that just this morning Fr. 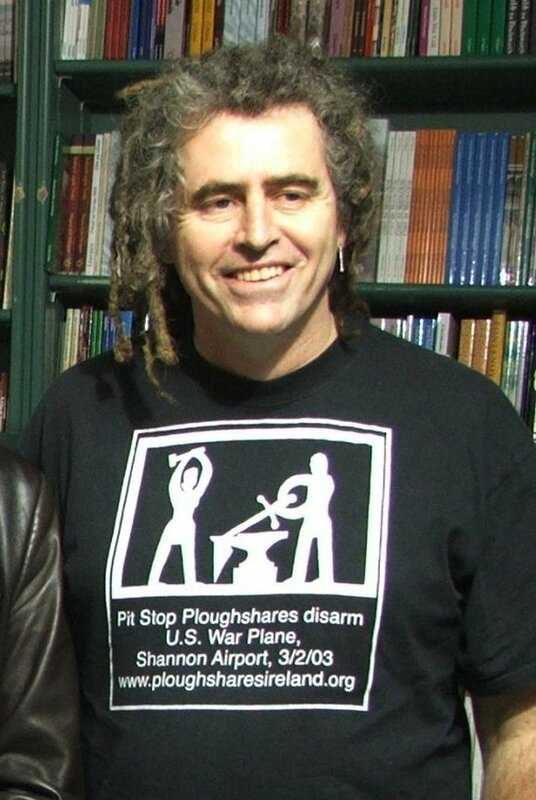 Martin Newell was released from Pentonville/London after serving a sentence for cutting into Northwood Headquarters on the Feast of Innocents 2008 in resistance to the wars on Iraq and Afghanistan. I subsequently checked in on Ciaron’s blog to see what else is going on and found a post by the title Mixing it with the Catholic Chaplain for British Military Land Forces. It was, for me, the perfect antidote to the sanitized institutional church activities that take up the better part of this time of year. In this season in which we prepare for the birth of the Prince of Peace while simultaneously embracing the societal/cultural messages of violence, Ciaron summarized for us the essential,central problem(s) of the Church from a historical context (which the Church ignores at its own peril or perhaps at the risk of losing what is left of its soul). Here are what he points out are the 3 responses to the issues of war and violence in church history. 1. Pacifism for the first 3 centuries, practised and taught by Jesus living under the Roman colonisers and the Herodian collaborators – embraced by the Catholic Worker movement and other remnants of radical discipleship. 2. The Just War theory thought up by Augustine after the 3rd. century Constantine shift when the church was legalised, patronised by the emperor and was fasttracked to become basic to Roman citizenship. This “Constantine Shift” turned christian ethics on its head. The ethical question of how do you run the Roman (British, Portugese, Spanish, any empire ) in a Christian way? should never have been our problem…like how do you run a firing squad in a christian way? is not our problem either. 3. Crusades – “kill em all and let God sort them out”. Theologically discredited in the Catholic tradition but is very much the theology of nuclear weapons, aerial and naval bombardment which is basic to the present wars on Afghanistan and Iraq. For me, Ciaron’s post is an important reminder to us that although the Church is supposed to be the conscience of the society (rather than the tool of the Empire), we as people of the light must be the conscience of the Church. And who knows where – such as Ciaron O’Reilly’s “debate” with a military chaplain – opportunities might arise to remind the Church of its errant path for the past roughly 1700 years. May we continue to seek light in these dark days, and may it help us remember our way. Oh what a year it’s been! For those of us in the Anti-Nuclear and Anti-War Resistance Movement it has been a year of continued struggle against an ever growing (and out-of-control) Military-Industrial Complex. From drones to nuclear weapons and more, dedicated peacemakers have steadfastly resisted the dominant culture of war. At places like Fort Benning, Y-12, Kansas City, STRATCOM, Hancock Field, Downing Street and Jeju Island, resisters stood their ground taking a stand for justice and peace. They spoke out against a host of immoral and illegal actions by their governments. And for their actions many were arrested, tried and put in prison. Acting on conscience, they have become prisoners of conscience. Some serve a few days or weeks, while others serve months or years. Helen Woodson was recently released after serving nearly 27 years for the Silo Pruning Hooks Plowshares action! All are jailed unjustly; it would be inconvenient for governments and the corporations they serve to face the truth and let real justice be served. They may be out of sight, but they are not forgotten. Consider spreading a little extra Holiday cheer this Christmas. Send a message of support to one (or more) of these prisoners. Include some news from the outside. I frequently print articles from the progressive press – Common Dreams is a great source – and include them with my letters. You can find addresses for prisoners of conscience at the Nuclear Resister’s Inside & Out page. The Nuclear Resister also keeps us up-to-date on what’s happening in the anti-nuclear and anti-war resistance movement in the U.S. and around the world. Finally, a BIG SHOUT-OUT to all who support resisters – including those who support them during actions, to legal teams, to prison support teams – on their journeys. We’re all in this together. Here’s to the Next Year in Resistance. One year ago, on December 13th, the five members of the Disarm Now Plowshares were found guilty of multiple charges associated with their 2009 Plowshares action. In honor of their collective sacrifices for peace we share this Prayer for Peace, adapted by Fr. Steve Lantry, SJ. Hear our voices, for they are the voices of all prisoners of conscience. will suffer when people put their faith in weapons of war. wisdom of peace, the strength of justice, and the joy of fellowship. the difficult road of peace. to need with sharing of self, and to war with peace. changes human hearts, and you grant to the world your everlasting peace.